If you are looking to a rustic touch to your special day then look no further. Cassiani Collection has designed an exclusive line of unique cake toppers. 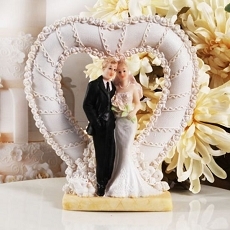 Each square acrylic cake topper is laminated with our exclusive vintage love design, it is accented with a rustic wood background, a unique pattern with the word love. Each topper measures 4" L x .50" W x 4" H and comes packed in bubble bag .